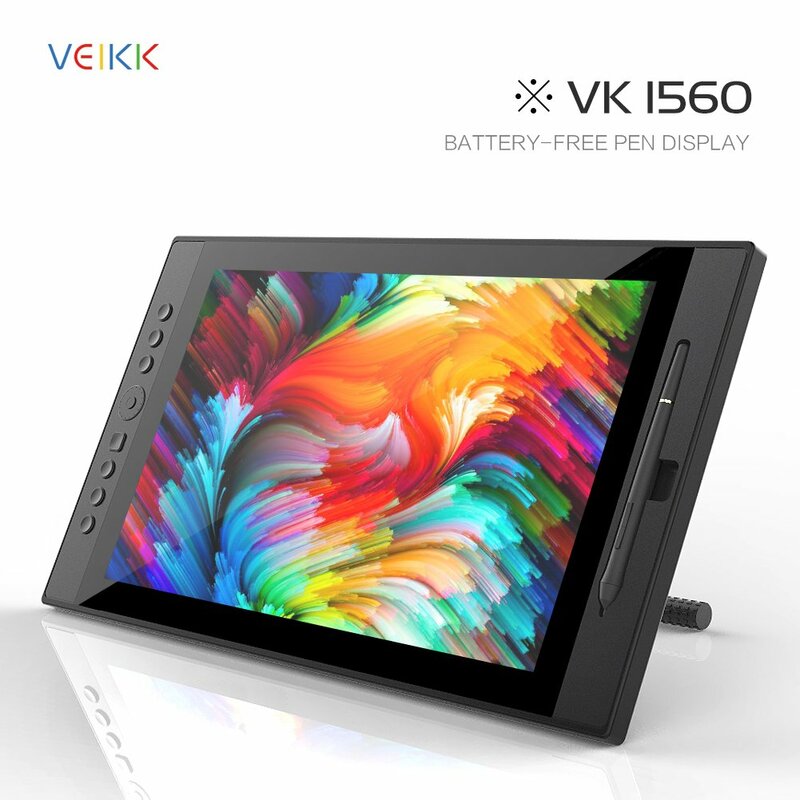 Another product from VEIKK, actually, VK1560 is the only pen display they have for now. And it is awesome! I wasn’t sure about this product at the beginning. However, I was totally blown out by this product when I open the box. It is so sleek and slim. The hot key button and stylus pen are velvet touch. Excellent first impression! 1> OK, there is no instruction or driver CD in the box. The 3 cords are very straightforward. 2> Go to VEIKK website and download the driver. 3> Please uninstall ANY other tablet driver. Reboot your computer if necessary. 4> Install the VEIKK pen display driver BEFORE connecting tablet to computer. 5> Connect pen display to computer. 6> Now you can play with the setting and try to find what works for you. 7> FYI, the top layer screen protector that comes with a little sticker is needed to be removed. BUT, there is a second screen protector which is much less glossy underneath. Please DO NOT remove that one. I believe that one is really for “protection”. 8> Screen display buttons are located on the back side of pen display. You can play with that too. But for me, I feel the default setting is sharp and vivid enough. 1> I love the stylus pen! It DOES NOT need to charge. As I mentioned I use Huion tablet and their stylus pen requires charging. This is not a significant difference. However, I have very limited space. So when I do traditional painting, I can’t set up pen display. Here comes the struggle part, whenever I want to switch to pen display, I find myself hold a stylus pen with no battery. But again, this is only personal situation, if I have one more desk I would set up my pen display permanently and keep charging station close. 2> The hot key buttons are awesome but I don’t need that many. I like to use keyboard for express keys. Even after I set up the hoy key on this pen display, I still reach out for my keyboard. I notice that I only use half of them. Top 3 and the dial button to be exact. 3> This pen display is slim and light. So if I push too hard on the screen it will move. I try to fix the stand but finally just use my other hand to hold the corner. Since I’m right handed, my left hand can rest on the hot key buttons. Not bad. 4> The colors are sharp and saturated, very beautiful! I use both Corel Painter and PS and they all work fine. 5> Please don’t till the pen too much or it won’t response. Other than that, this pen display has nice reaction time. Before I invested pen display I though the bigger the better. That’s why I got my GT220. And yes it is big but might be a little too big for my tiny space. I have to move that heavy tablet all around try to find a standing place for it. But 1560 does not have this problem. I can easily store it in the drawer of my desk. For those who have limited space or prefer something easier to carry/move around, or want something bigger than ipad/Cintiq 13, size of 1560 pen display is perfect. For those who love digital painting and want to invest in pen display on a budget, this one definitely worth every penny. So far, it delivers all my needs well, I feel happy just by looking at it. Instantly better. You still need a lot hard work. As long as this pen display fulfills your needs and makes you happy, you deserve it.